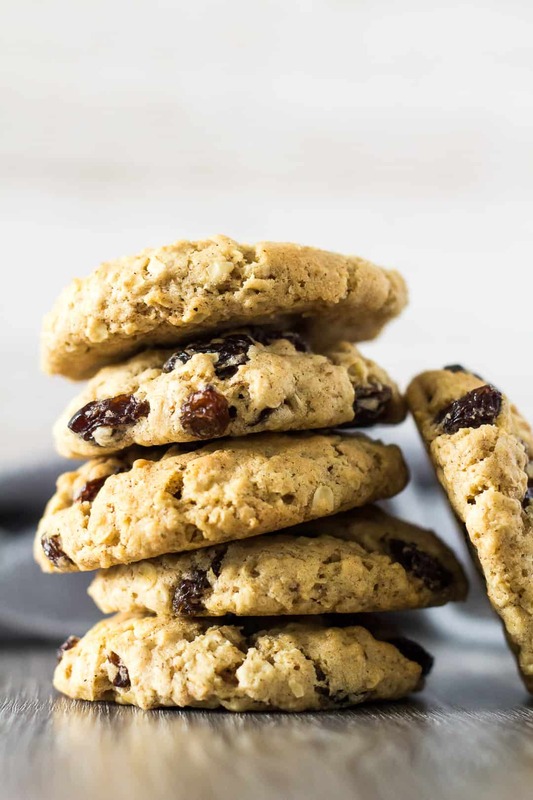 Oatmeal Raisin Cookies – Deliciously thick and chewy oatmeal cookies that are perfectly spiced with cinnamon and nutmeg, and loaded with raisins! I’m not a huge fan of raisins, particularly on their own. But I LOVE the extra chewiness they give cookies, especially these cinnamon-spiced oatmeal cookies! I brought you this flavour combination first with my Cinnamon Raisin Biscotti (which I hope you’ve been loving! ), and now I bring you my Oatmeal Raisin Cookies. 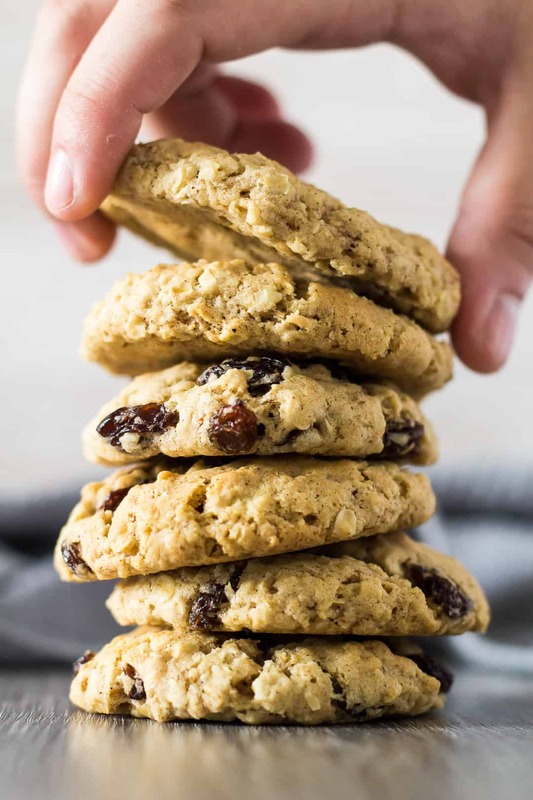 These oatmeal cookies are soft, super thick, and chewy. They’re perfectly spiced with cinnamon and a little nutmeg, and they are stuffed full of raisins – which adds to the chewiness! 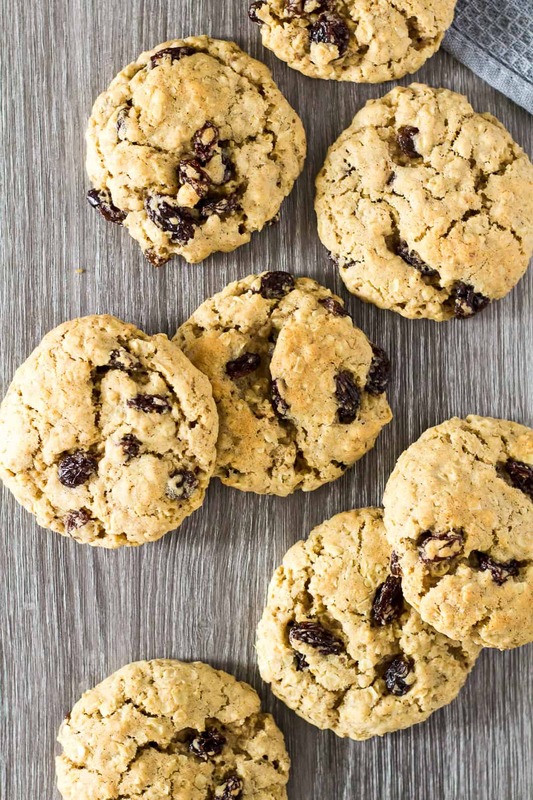 To make these cookies, simply whisk together the flour, oats, baking powder, baking soda, salt, and spices. In a separate bowl, whisk together the butter and sugars. Add the egg and vanilla, and mix until combined. Add the dry ingredients, and mix until just combined, then fold in the raisins. Roll the dough into 1.5oz balls (you should get about 20 – 22 balls), and place them onto a baking tray lined with parchment paper or a silicone mat. Bake for 10 – 12 minutes. 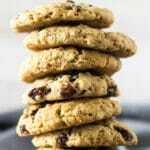 Allow the cookies to cool on the baking tray for 5 – 10 minutes before transferring them to a wire rack to cool completely. Done! loaded with raisins which adds extra chewiness! To store these cookies, keep them in an airtight container at room temperature for up to a week. Prefer freshly baked cookies? Cookie dough balls can be kept in the fridge for up to 5 days, or frozen for up to 3 months! Try these delicious cookies next! 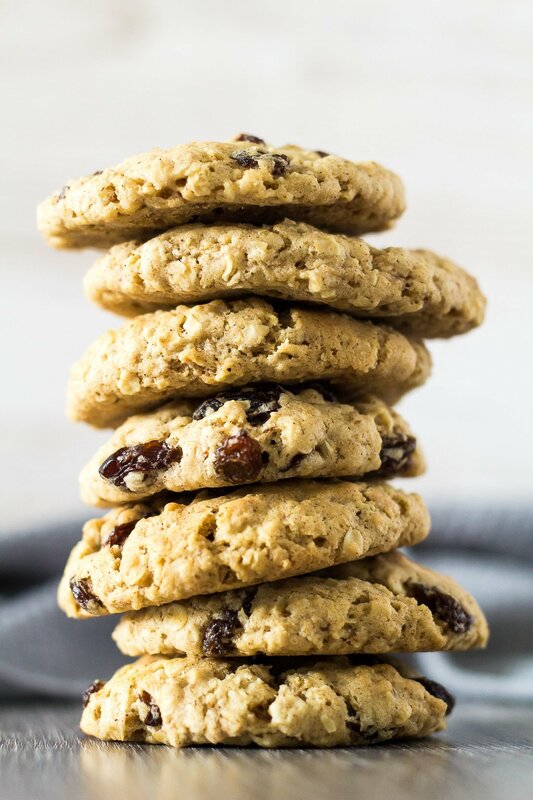 Deliciously thick and chewy oatmeal cookies that are perfectly spiced, and loaded with raisins! Preheat the oven to 180C/350F/Gas 4, and line a baking tray with parchment paper, or a silicone mat. Set aside. Whisk together the flour, oats, baking powder, baking soda, salt, and spices. Set aside. Whisk together the melted butter and sugars until combined. Add the egg, and vanilla, and mix until combined. Add the dry ingredients, and mix until just combined. Fold in the raisins. Roll the dough into 1.5oz balls, and place onto the prepared baking tray. Bake for 10 - 12 minutes. Allow to cool on the baking tray for 5 - 10 minutes before transferring to a wire rack to cool completely. Cookies stay fresh, kept in an airtight container, at room temperature for up to 1 week. Cookie dough balls can be kept in the fridge for up to 5 days, or frozen for up to 3 months. Bake from frozen for an extra minute. Oatmeal raisin cookies are looking amazing. Nice blog with delicious recipes. These are probably my favorite cookies! I love how plump, soft and chewy they are. Delicious! I just want to double check, porridge oats would be rolled oats?